The question concerning myMarinetteMenominee is not if we won or lost The Small Business Revolution, but what we have created. Normally a community would need a tragedy to get people to pull together as myMarinetteMenominee has. The momentum gained by our acts of unity has given us new confidence in our abilities. The results of this process are that we have an awareness of how we can build on our natural strengths and opportunities. The lesson here, it is not about what we have, but what we do with what we have. Don’t get me wrong; I believe that our region has an uncommon amount of natural resources and assets upon which to build. The contest is over, but the unity in community needs to live-on to benefit our future generations.What did we accomplish? People, working together, selflessly and tirelessly to deliver their part of the effort. We discovered the amazing number of local independent businesses we have. We found that forward motion starts with a mission and not a plan. We experienced how not competing with ourselves and using that effort to pull together is the better application of our energy. Working together makes us stronger. Nothing about #myMarinetteMenominee was convenient. The project moved at a pace that allowed us to respond but not debate. So, we learned about making progress without stopping to solve problems that did not need to be solved. By focusing on the mission beyond just winning the contest, people have acted with mutual trust and respect for each other. Mutual trust and respect is the secret sauce that binds us together for the journey ahead. The vision does not change. And that is to create a vibrant community where youth can exercise their talents where they grew-up — a place where others want to belong. While taking this moment to reflect on what we have accomplished, I must thank Kim Brooks, that I have the pleasure to work with, side by side. She has devoted great talent, time and tireless energy to get us where we are. Barb, my wife, for her support and doing what it takes to keep our business running and allow me the freedom to do my part. And, ALL the amazing people who have stepped-up to make so much happen in little over 100 days. Now, we move forward propelled by the momentum generated by all this effort. We have crossed the river. I cannot wait to see what we build from here. As one of the leaders in our revolution, Jeri Keepers said ”I don’t think anybody wants to go back to being two separate towns, with or without this we are Marinette/Menominee, moving forward." Please do all you can in continuing to pull together and keeping the Unity in our Community. 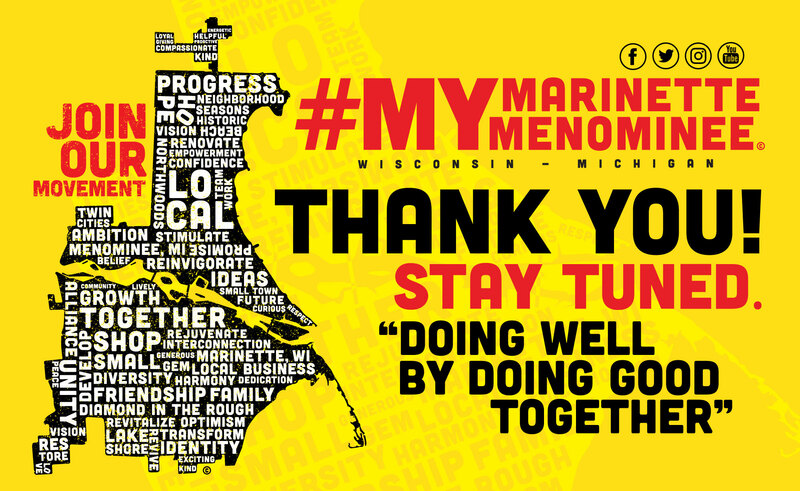 I want to express my sincere gratitude to the hundreds of people who gave their talent, time, and resources to make MyMarinetteMenominee an overnight success. Thank you for proving what we all knew was true: this is a phenomenal place to live, learn, work and play. We can all be proud of the tangible unity that we accomplished together. 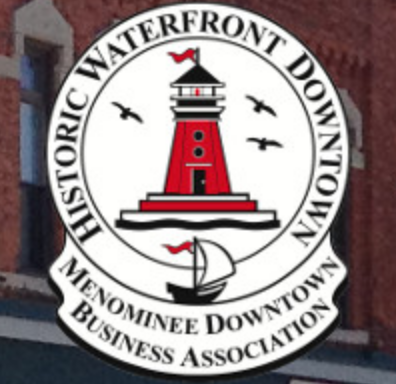 While I am frustrated that Marinette and Menominee were not elevated into the top tier of the Small Business Revolution, I know that our team gave it their maximum effort. We left everything on the field, and I have never been more proud to be a part of something. Scores of gifted people gave their hearts and souls because they wanted to make our community a better place. Now, it is up to us to keep that momentum going. This grass-roots effort was never been about winning a contest. My friend Keith Killen and I had hoped we would be able to use this tool to propel our twin cities into the important work of community development and the revitalization of our downtowns. We want to build a more vibrant community that will thrive for generations to come. Wonderful things, both big and small, happened as a result of this process: our two high school bands played together for the first time in history, a common message of unity now spans the interstate bridge, our towns have two namesake songs and a jingle, competitors worked together for a common goal, and on and on. Yesterday was a set back. Our goals will take a little bit longer to achieve, but we will get there. And, we will do it together. The talent that has surfaced through this process is inspiring. I am personally emboldened by the energy and enthusiasm that this challenge unleashed. Looking back, there isn't a single thing that I would have changed. In the end, our unified towns were too geographically disparate for Small Business Revolution's liking. Please stay tuned and stay engaged. Help us build the more vibrant community we all deserve.